Mary Cassatt’s place in the history of American art is unique, not only because she was one of the few woman artists of any nationality to succeed professionally in her time, but also because she was the only American artist to exhibit with the French Impressionists. After mastering the requirements of academic painting, Cassatt broke away from tradition and joined Edgar Degas, a close friend and mentor, in the exhibition of Impressionist artists in 1879. Cassatt embraced the technique of the Impressionists while developing a highly accomplished individual style. This entry was posted in art and tagged art by Lilli Day aka bookbabie. Bookmark the permalink. 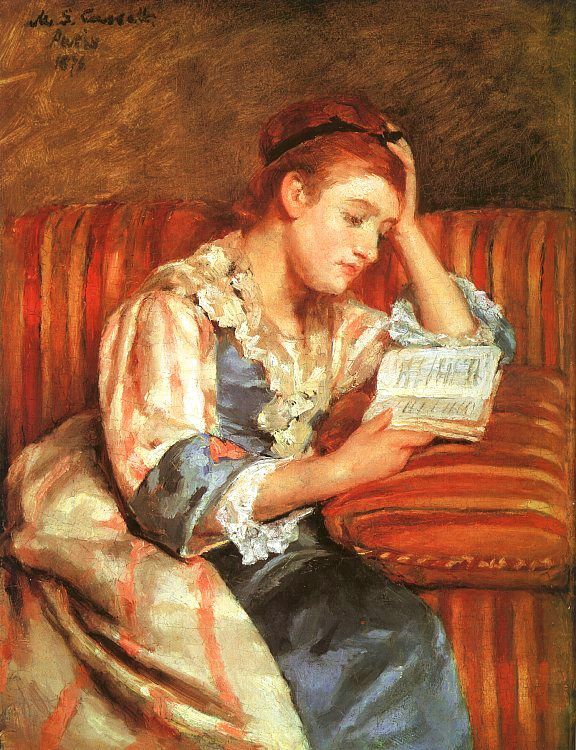 Not too long ago, a fellow art student cited Mary Cassatt as a Feminist. My jaw dropped a little. Why is it that because she’s a woman and she paints, people automatically lump her with Feminism? It is especially hard to say whether or not she promoted the stereotypical societal role of women with her paintings of domestic life. How many men went to bed each night, with a fantasy that a woman’s place was as illustrated by Cassatt? The surface of her paintings is so beautiful! It vibrates with energy like a windy landscape. It is hard to believe how revolutionary this technique was in its day. It was scandalous even. Cassatt makes me so jealous. She grew up in a rich as hell family and was as good at painting as anybody who ever lived.